Are you passionate about acting and love to work with kids? Do you need a fresh start and an exciting new career? 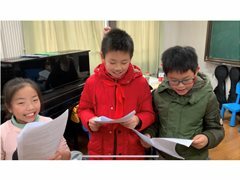 China Rencai in Shanghai is an agency that hires people with exciting and bubbly personalities to teach drama classes at schools all around the city. Drama teachers at China Rencai are a fun and organised group who work hard to deliver exciting performance lessons to kids of all ages. Our teachers design exciting semester plans that end with a final show, usually staged in the second last week of school. Schools love to see the kids performing confidently in English, and it's really rewarding for us too. The goal for schools is partly for the kids to practice English with native speakers, but also so that they build confidence and become more ambitious. It's a fulfilling job that feels fresh and new everyday, as our schedules often have us travelling around via public transport and delivering lessons at different schools. Drama teachers are supported in their lesson plans and will be looked after in the early days while they're getting their feet. We'll help you feel comfortable in the classroom and help you with scripts and lesson plans to get you going, but before long you'll be teaching no problem and having the time of your life! Teachers are supported by a big and well resourced company that's backed by the Chinese Government. - A bachelors degree (in anything, for visa qualification purposes). We will assist you every step of the way in getting your Chinese working visa and will offer you a year long contract that is renewable. Come along for a working holiday or make Shanghai your new home! We offer support, a full time career, a new adventure and the chance to explore an incredible city and make some amazing new friends. Successful candidates are responsible for their own flight to Shanghai, however upon successful completion of a contract the company will pay for your return flight home up to a value of approximately $1000. HOWEVER if you'd like to stay and sign another contract, that money is yours as a bonus. Your salary will be negotiated based on your experience and credentials. We'll help you open a Chinese bank account, buy a SIM card, transport card, basically everything you need to be successful in a new city. We've got your back. Your arrival date in Shanghai would be August 24th with your contract beginning a week later. If you're interested, please apply. We are also hiring ESL teachers. We need drama teachers with happy personalities who love kids and are self modivated. A bachelor degree (in anything) is required. Support provided and great pay and benefits for the right candidate. Experience preferred. We’re looking for fun and motivated ESL teachers to join our team. We provide the curriculum and all the support you’ll need. Great pay and benefits! A bachelor degree (in anything) is required. Experience preferred. We’re looking for an entertaining indervidual who can teach sport at a Shanghai Kindergarten full time. You would dance and play volleyball and have fun with a group of 5 year olds as your full time job! A bachelor degree and a love of little ones is needed.